William Tell and Robin Hood were fair hands at them. In war, they can be crucial to battle strategies. 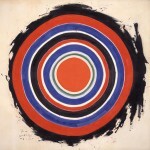 But in the art world, it was Kenneth Noland who took targets off the practice range and put ’em on the map. 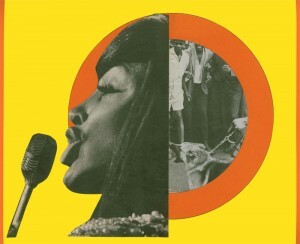 Lake has a new exhibit of collages on view at Augen Gallery‘s DeSoto space, and while they draw obviously on Noland, they’re also very much their own thing: not so concerned with Noland’s color-field theories, much more concerned with social meanings. Lake, who is also a journalist (she interviews artists on her lively program Art Focus on KBOO community radio) has long been a force for feminism on the Portland art scene, at one point even keeping a running tab on the number of male versus female artists whose shows were reviewed in the local press to point out what she considered a sharp imbalance. She’s been fascinated by the Photoplay culture since childhood, and a lot of the images she uses in her collages come from such fan magazines. When she talks about her collage work a torrent of insider celebrity information engulfs you and threatens to sweep you out to sea. Unlike a lot of collages that have an intricate mosaic feel, Lake’s targets tend to be simpler, pared down to a couple or three juxtapositions: the target itself, of course; the woman in the target; a physical context, usually nabbed from an art book. She pairs Liz Taylor with a Delacroix, Ann-Margret with a John Chamberlain, Marilyn Monroe with a Goya. Targets apparently are an old fascination, too. Lake talks about growing up in the southern Oregon town of Ashland — a hybrid of working-class, college and Shakespeare festival cultures — and sneaking onto the police department’s target range to steal targets. Obviously the image means something to her. Meanwhile, can her targets take the shots? Certainly they set themselves up for a charge that they’re too easy, simplistic, didactic. I don’t think the charge sticks. The pieces have clarity, and there’s plenty of room inside these images to think about what the juxtapositions imply. The goddess, the whore, the victim, the manipulator, the idolized and idolatrous, the creator and the sellout. Sure, these women are squarely inside the target — and for the most part they considered the advantages and disadvantages and chose to be there. You can look at these collages in a lot of ways, and I think Lake likes that.